Backing Up Bases: Most hits to the outfield will trigger the need for back up. The pitcher's immediate response should be to sprint half way between third and home, turn around, and quickly assess where the throw will go. This usually means standing in foul territory behind a base (usually third or home) and in line with the throw. The pitcher needs to be far enough away from the base so the ball does not get past them if it gets by the fielder but close enough to be able to retrieve the ball to prevent base runners from advancing. Maybe the most important point to emphasize is to expect every throw to get past the fielder!!!! Be ready for it!!!!!!. 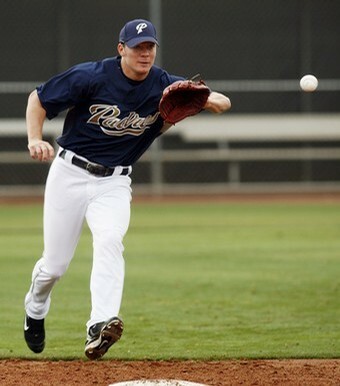 Covering First Base: On all balls hit to the right side of the infield, the pitcher must immediately break for first base. He must always assume that the first baseman won't be able to get to the bag in time. He can take one of two courses to the bag. If the initial play is to first, he should run to a point on the foul line about 10 feet from the bag, then run up the inside of the foul line to the bag. This will prevent collisions and give the first baseman an easy target. Immediately upon tagging the bag with his right foot, the pitcher should wheel around (toward his glove side) to check the other runners on base. In a double-play situation, the pitcher should go right for the bag, tag it with the right foot, stop, and turn toward the infielder making the throw. On all ground balls hit to the right side, the pitcher must immediately “GET OVER THERE” and be in position to take a throw at 1st. Being late loses outs!!!!!!! Fielding Bunts: With a runner on first or runners on first or second in a sacrifice-bunt situation, the pitcher will share coverage of the infield grass with the third baseman, the first baseman, or both. The pitcher must field anything he can reach and, whenever possible, cut down the lead runner. If he cannot get the lead runner, he must make certain to get the out at first – when in doubt, take the out!!!!!! They are giving it to you. Always be mentally prepared to be part of every play – your responsibilities do not end when you throw the pitch!!!! !